The SE 300 B operates from any 9 to 52 V phantom power supply. It incorporates a switchable 12 dB/octave bass cut filter at 75 Hz to eliminate footfall noise and a switchable 10-dB preattenuation pad for high-SPL sound sources. A transformerless output stage ensures pristine full-range audio and prevents low-frequency distortion. 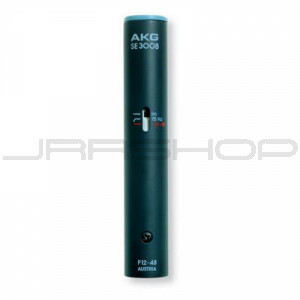 Available AKG Blue Line capsules: CK 91, CK 92, CK 93, CK 94, CK 97-O, CK 97-C, CK 97-CVR, CK 98.